In this Wednesday, June 13, 2018, file photo, the logos for Time Warner and AT&T appear above alternate trading posts on the floor of the New York Stock Exchange. 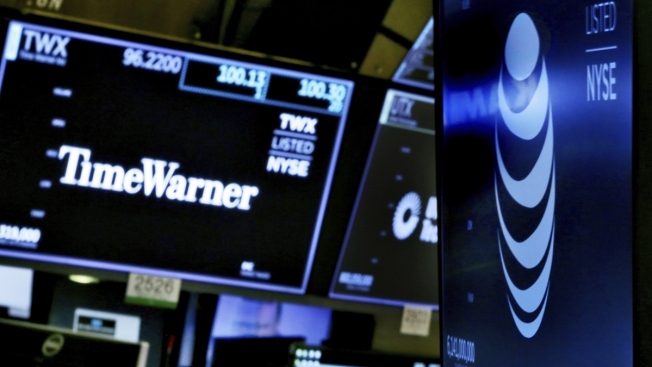 A federal appeals judge ruled Tuesday AT&T's merger with Time Warner can stand. The ruling brings closer the conclusion of a years-long merger process that has pitted AT&T against U.S. antitrust regulators. Shares of AT&T popped immediately following the news to trade roughly half of 1 percent higher. "The merger of these innovative companies has already yielded significant consumer benefits, and it will continue to do so for years to come. While we respect the important role that the U.S. Department of Justice plays in the merger review process, we trust that today's unanimous decision from the D.C. Circuit will end this litigation," AT&T General Counsel David McAtee said in a statement. In June, U.S. District Court Judge Richard Leon ruled the $85.4 billion bid was legal, and imposed no conditions on the merger. The Department of Justice maintained the merger would reduce competition in the pay-TV industry, citing concerns that AT&T, owner of satellite television provider DirecTV, could charge rival distributors more for Time Warner content and spur higher prices for consumers. Watch CNBC's full interview with AT&T Chairman and CEO Randall Stephenson from CNBC. The agency appealed the ruling in July, after AT&T formally closed the deal. The case holds wide-ranging impact on the type of vertical integrations that have become common among tech and telecom companies, and has taken on a political bent with regard to the Trump administration. President Donald Trump is an outspoken critic of CNN, a Time Warner asset that came under AT&T's jurisdiction with the closing of the merger.